The weekly AAII shows a slow increase in bullishness. The bulls inched up by a smidgen (1% points) to 35.9% while the bears fell 3.3% points to 26.2%. More importantly, we continue to see a lack of conviction in the numbers. The third camp, “neutral”, is once again the majority with 37.9% - this is the new record since early 2006. You’ll see this same indecisiveness reflected in the options sentiment data as well (below). According to the latest Investors Intelligence survey, the bulls are at 42.1%, up slightly from last week (41.1%). The bears fell back somewhat to 22.7% (from 23.3%). So we are seeing the gap between the two camps widen once again with the bulls surging to almost twice the bears. But to reach the extremes we saw back in late 2009 and early 2010 the ratio would have to get even more extreme (3.33:1). The HSNSI is based on the average recommended exposure among a subset of short-term stock market timing newsletters tracked by the Hulbert Financial Digest. The recent market rout spooked a lot of these short term market timers. At the start of the year, when the market was going strong, the HSNSI was at 62.20%. At the bottom of the correction (early February 2010) it fell to just 13.8%. And it is back now to 62.8% - almost where it was at the January high. Regular readers know that once in a while we check in with this lesser known indicator because it has an uncanny ability to track retail investors and act as a sentiment guide to the market. If you’ve ever been curious to learn more about the DSI you have a singular opportunity next Thusday March 11th. That’s when Jake Bernstein, will be giving his first ever Daily Sentiment Index webinar to not only explain the DSI but also go over how to specifically use it to make money trading. As a bonus, everyone that attends will get the complete historical data file (to 1987) for the DSI plus a month of updates. That by itself should make it worth your while if you’re a serious trader. So clear your schedule and join me next Thursday at this 2 hour webinar. Go here to reserve your spot today. This week we had the final results from the Thomson Reuters/University of Michigan survey for the month of February: 73.6%. This was a slight decrease from January’s final number: 74.4%. 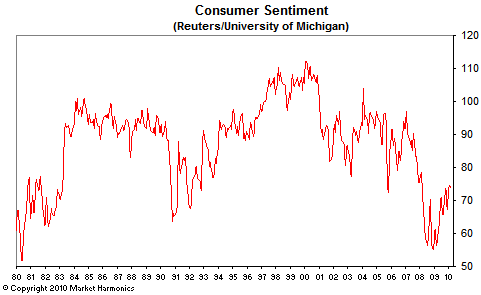 Similar to the Conference Board’s Consumer Confidence results, the Reuters/Michigan survey’s weakness was in the current conditions. The outlook for the future improved slightly but was still off its January high. The flaccid real estate market and the sharp jump in personal bankruptcies no doubt played a large part in the weak consumer mood. 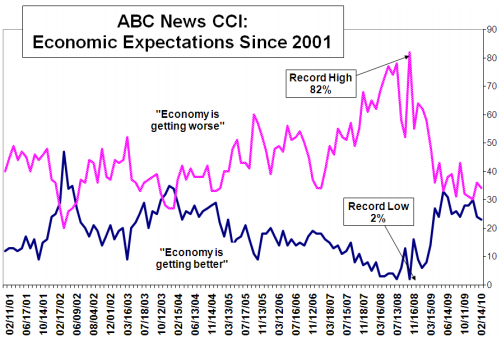 We can look forward to the latest monthly report for the ABC/Washington Post Consumer Comfort index. Or maybe not, considering how the other two surveys have been going. 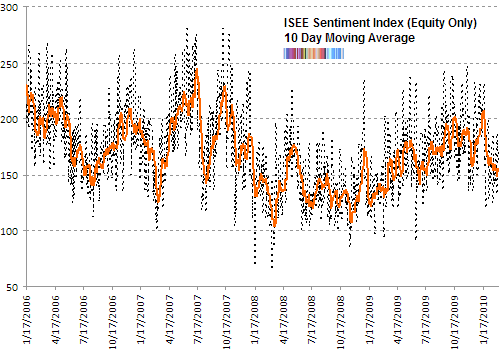 According to David Rosenberg, the last time that this sentiment poll averaged -48 for the past two months was in early 1992; a year which mimics this soft economic recovery. Back then it took the US economy 2 years to firm up and for the Fed to start raising interest rates. And it wasn’t all that great for the stock market which eked out a 5% return. Volatility, as measured by the CBOE Volatility Index (VIX) continued to shrink this week. It closed the week at 17.42 which is the lowest since early January 2010 (when the stock market topped out last). I prefer to look at the relative position of the VIX (to its 200 day moving average) and according to this, it is also approaching an important juncture. Previously it fell this low in mid-July 2009, mid-October 2009 and again in January 2010. Each time the stock market either stumbled or plateaued. According to the latest weekly report from ICI, US investors poured more than $7.8 billion into bond funds; continued to ignore US equities with a paltry $151 million (with an M); and threw a few chips for good measure into foreign equities, $1.8 billion. This is exactly the same pattern that we’ve observed for a good while now. So nothing really earth shattering. Except that the same trends continue: ignore equities, with some small exception to emerging markets and go all in for fixed income. According to TrimTabs, February had withdrawals from US equity mutual funds of $5.5 billion and $28.1 billion inflows into bond funds. If you’ll recall, they infamously came out with a controversial call early this year saying that the stock market rally was suspect because they couldn’t figure out who was buying. They strongly implied that the government was manipulating futures to drive underlying prices higher. The tinfoil hat crowd loves this because they now had a reputable firm (partly owned by Goldman Sachs even!) saying what they had been saying since April 2009. Personally, I was very skeptical: Asset Flows & The Plunge Protection Team Conspiracy. Surprise! TrimTabs has switched sides and is now bullish. Of course, when he was on CNBC yesterday, he wasn’t asked to address their previous report on market manipulation (I’ve long since given up any expectations of actual journalism from CNBC). In any case, TrimTabs’ rationale for turning optimistic is a nascent economy recovery they spied in January based on the econometric statistics. Perhaps even more shocking, for once they agree with the BLS numbers! Based on tax-withholding data, they estimated job losses in February 2010 at 30,000 while the official numbers were -36,000. Charles Biderman and the rest of the crew at TrimTabs weren’t as rabid bears as say, James Montier at GMO, but this switch will definitely make many stand up and take note. Biderman also notes the pickup in stock buybacks and cash mergers and acquisitions. More on that below. 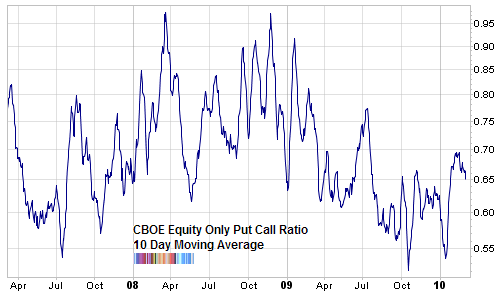 It is difficult to see the short term action in this long term chart but the 10 day ratio of the equity only ISE call put ratio (orange line) has curled up from its recent low of 149 to 155. The highest daily level this week for the ISE was on Wednesday (186 - implying retail option traders were buying 186 calls to open trades compared to just 100 puts). According to JP Morgan, S&P 500 constituent companies have $3.2 trillion in cash burning a hole in their balance sheets. If we exclude banks who, let’s face it, really need the cash, the total is reduced to $1.1 trillion or 11% of total assets. While everywhere you look there is doom and gloom, corporations are actually flush with cash as the current level is higher than the long term average (8%) and is a 60 year high to boot! So not surprisingly, corporations are putting that cash to work as they have before: share buyback programs and M’n'A. If the trend in the first few months continue, then 2010 will be a notably change from last year. So far, a total of $68.5 billion has been authorized in buy back programs compared to just $125 billion for all of last year. Keep in mind that such proposed buyback programs are subject to adjustments, cancellations and changes. This change in sentiment denotes a more optimistic and confident corporate culture. But the cynic in me can’t help but notice that it is just the same game that’s been played before. My personal opinion is that buy backs are a very bad use of cash. The people making the call are incentivized of course because their share option compensation will only improve the higher the company’s share price is. But from a long term perspective, both the company and the country will do better when cash is used for R&D, Capex and accretive acquisitions. In last week’s sentiment overview we looked at Merrill’s recent survey of institutional investors which highlighted their penchant for capex (instead of balance sheet improvement which they don’t really need). For the sake of an economic recovery however, it is important to note that the vast majority of recoveries from recessions have been fueled not by coporate capex spending but by a consumer lead revival. According to Gluskin Sheff, 80% of the time, consumers step up and pull the economy out of the recession. Capex has never done that.